In my quest to remove processed foods from our family's diet, I found even "healthy" granola bars to be filled with ingredients that I didn't recognize. So we decided to start making our own. My daughter actually found the following recipe, but I have no idea where. Unfortunately, that means I can't give credit to the recipe creator. But whoever it is, I am thankful for this yummy recipe. I thought I would share it here, so that you can use it, too. 1. Line a 9x13 baking pan with parchment or wax paper, so that the parchment paper extends over the edges of the pan. Preheat oven to 350. 2. Combine oats and cinnamon. 3. Beat the egg white until frothy. 4. Beat in the honey and the peanut butter. 5. Add to the oat-cinnamon mixture. 6. Pour the melted butter over everything and stir until well combined. 7. Stir in the chocolate chips or whatever goodies you have chosen. 8. Bake for 25 minutes, until nicely browned on top. Remove from oven and cool for 5 minutes. 9. Using a sharp knife, cut into 12-16 bars. Return to the oven, lower the heat to 300 degrees, and bake for 15 more minutes. 10. Remove from the oven to cool. 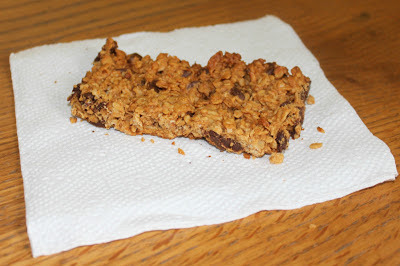 (They need to cool completely for the bars to set or they will become crumbly). This is a healthy snack (as snacks go!) that we can feel good about feeding to our families. If you give these bars a try, I would love to hear how your family likes them.